Houston’s Race 4 Eight IV Stop #3 features one of the largest and deepest qualifier draws in history, as 12 current or former pro qualifiers have entered the 30-man draw. Each qualifier final promises to be spectacular, with nearly each of the eight finals featuring pick ‘em matches. Let’s take a look! Top-seeded Anthony Selestow faces former SR48 champion Bear Meiring in a showdown between two generations of athletic and exciting stars. The two possess freakishly similar styles, and despite conceding nearly 15 years to his opponent, Meiring is every bit as fit and quick and “The Teen Heartthrob.” TTH “Selestowed” Sean Lenning in back-to-back R48 events in Houston in 2013 and 2014. Could Meiring “Selestow” Selestow in 2015? Daniel Cordova will likely face San Francisco’s Erik Torres in a matchup of two early 20’s rising stars in what could be the future of the R48 tour. Cordova qualified for the first time at Tucson’s R48 IV stop in November of 2014 with an impressive victory over Shorty Ruiz, and Torres has shown the ability to hang with the best in the game. This one will be close. Former R48 I Elite 8 Luis Cordova rebounded from a year away from the tour during the R48 II tour in 2012-2013 with a solid top 15 finish on the R48 III and started the R48 IV season with a solid 7th place finish at R48 IV Stop #1. Cordova will likely face former junior standout and the immensely talented Marco Lemus. This could very well be one of the day’s most exciting clashes, as two of the best right hands in the sport will be on display. Dave Munson returns to the R48 after a nearly two-year absence from the tour and will likely face Adam “Weekend at Bernie’s” Bernhard in their qualifier final. Munson appeared to be on the fast track to handball stardom several years ago before being derailed by shoulder surgery, while “Bernie” qualified for the second time at Tucson’s R48 IV stop with a win over Samzon Hernandez. Both guys will be hungry for a spot in the big dance. Expect fireworks and possibly overtime in this battle. Shorty Ruiz failed to qualify for the Race’s second stop of the season, dropping a close match to first-time qualifier Daniel Cordova. Ruiz will likely face pro tour veteran and surging Bill Mehilos. Mehilos is known as a bulldog for his relentless effort, while Shorty plays the part of a magician with his patented hybrid big ball/small ball style. This is another match of the day candidate and could very well prove to be the day’s most interesting contest. Stephen Cooney, Jonathan Iglesias, and Vic Perez will be favorites to qualify in their brackets, and each will be vying for successful qualifier triumphs for the second consecutive Race event. 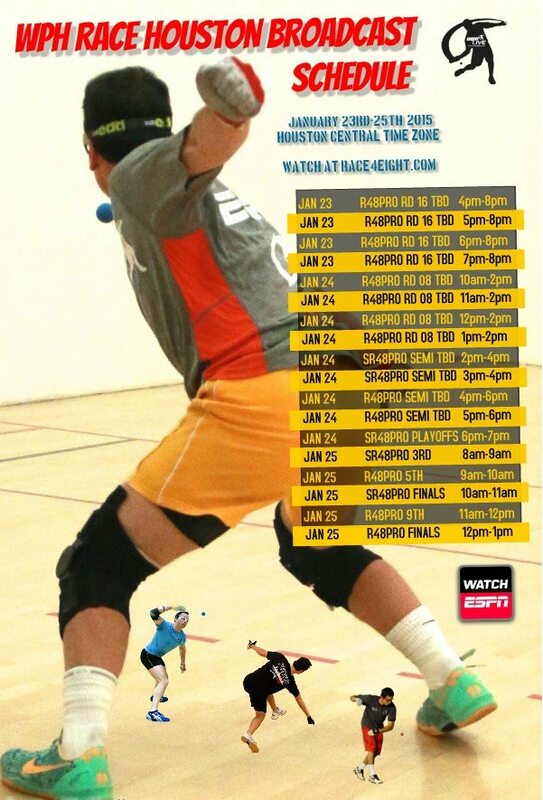 The Qualifiers will not be filmed, but like the World Players of Handball on Facebook, log onto wphlive.tv or follow the WPH on Twitter @dfwph and @wphlive for all of qualifier updates. Friday’s round of 16 main draw matches will be broadcasted live on race4eight.com, starting at 4 pm cst. If you have not already done so, purchase your All Access Webcasting Pass at thehandballstore.com and catch every kill shot, ace, and incredible match from Houston. The broadcast will switch to the Watch ESPN APP on Saturday morning (http://espn.go.com/watchespn/).